Ouch, it pains me to read this stuff. There’s a thread on FlyerTalk discussing Nerd Wallet’s valuation of airline miles and hotel points. Now I realize for most of my readers this isn’t worth mentioning, so the point of my post is just to remind everyone (including me) how most of the world views frequent flyer miles. First let’s look at their valuation of airline miles. On the low end, they value US Airways miles at 0.46 cents each, and on the high end, they value Continental miles at 1.01 cents each. First of all, let’s look at their method of valuation. They searched for the cheapest prices before taxes and fees for hundreds of flights, and then searched how many miles were needed for that itinerary. Then they (apparently) searched the number of miles needed to book on an alliance member’s airline, apparently by calling the airline directly. Then they divided both of those amounts by the revenue price of the ticket. Where do we even start? First of all, I assume they only searched domestic coach awards. Admittedly that’s what most people are using their miles for, though I think it’s misleading to have “making the most of your miles” as the title and then discussing domestic coach tickets. So basing value off a bad redemption is a bad place to start. Next up, this information can’t even be accurate. If they called the airlines to find out how partner award availability was, they’d have different results. Within alliances, airlines have access to the same availability for the most part. So you’ll find that for domestic awards, Continental, United, and US Airways have virtually the same availability. Yet somehow a Continental mile is worth double as much as a US Airways mile. Beats me. That’s it, I’m doing my own study! I’m going to focus on international first class awards redemptions (which I’ll claim is the best way to “make the most of your frequent flyer miles”), and then I’ll use the same method they do. My results will be equally worthless. Heck, here’s the beginning of my study. 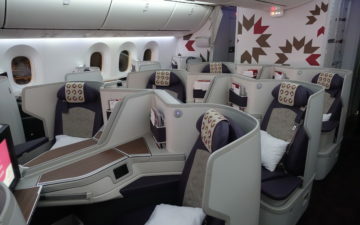 There’s first class award space from Washington to Kuwait next week. 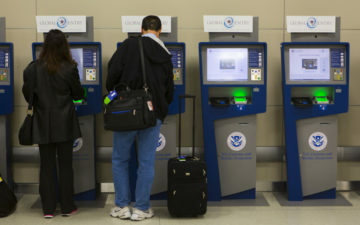 The cost is 145,000 United miles, and the cost of a revenue ticket is $16,686 plus tax. I guess that makes my United miles worth over 11 cents each! And I won’t even touch the hotel chart. If I believed what it said, I guess it’s time to change my loyalty to La Quinta! I think the point is a good one: people *do* tend to value their miles way too highly. A ticket to Kuwait is only “worth” $11k if you yourself would ever pay that much for the ticket. If you wouldn’t, then it isn’t worth that amount. @ Fernando — I don’t disagree that *some* people value their miles too highly, like the person in the American forum on FlyerTalk that claimed they got 19 cents of value out of their miles by booking Cathay Pacific first class, but I think for the most part people undervalue their miles. I think an American, Continental, United, or US Airways mile is worth somewhere in the range of 1.4 to 2.0 cents each. Read up on OPPORTUNITY COST in any Econ 101 book. Those miles (in the FT CX thread) are worth 19¢ each because they can be exchanged for something of value equivalent to that. If you choose not to make that exchange it’s because you have other (primarily non-financial) “reasons” (“costs” in econ speak) that make that particular exchange worth less than something else you could use the same miles for. But at the end of the day they’re worth the most valuable thing you choose not to trade them for. Really, it’s Econ 101… It’s not new, not difficult, but for some reason always misunderstood.
! My last US first class award ticket is up to 30,000 dollars for 140,000 miles. La Quinta here I come! @Vagabondjim – I am not an economist, but it seems to me that to say the miles are worth 19 cents requires that you be able to sell the award ticket to someone else for the full $11,000 (using the numbers in this thread). But as we know, you can’t resell an award ticket under the terms of the program. For that reason, it is irrelevant that the airline sells the F ticket for $11,000. You can’t sell it to anyone else for that price. So, assuming you would not pay $11,000 yourself for the same ticket, then you are not getting 19 cents of value out of each mile. JMHO. Oops, I just realized I mixed up numbers from different scenarios. But the point is the same. I am with you. I use the math that most FF points are worth 1-3c each a I will never pay for a biz class ticket. That said, my ORD-GOT trip next year, for 2, got 100k each for biz tickets (yes I am good), and the biz ticket’s would have cost $7405 total or $0.37 per skymile value. Now if I use the coach ticket as a baseline I get a cost of $2301 or $0.23 per skymile at the 100k for two coach seats. Bottom line is that if you pay off your card each month, go for big CC sign up’s like the 75 & 100k AA going on now (shout out to Gary – http://boardingarea.com/viewfromthewing/2010/07/30/so-far-so-good-100000-mile-american-airlines-credit-card-signup-bonus/ ) you can do very well and have your points / miles worth a bunch! Consider this scenario: my money is tight, but I have accumulated 150,000 redeemable miles through company travel. Do I choose the premium travel to Kuwait for myself and have the satisfaction of knowing that I have extracted 11 cents worth out of each mile, OR do I get six domestic tickets for a family of 3 to visit grandparents in Seattle TWICE and be sad over the meager 1.2 cents worth of each mile? Vaga, back to econ 101 for you. You’re simply espousing an intrinsic theory of value and I’m espousing a subjective one. In my world value is certainly not equated with opportunity cost – that’s ludicrous. For the last 5 years or so, I’ve averaged 10¢/mile — always in international first, of course. Come on. IAD – KWI on United First for 16 grand? For $13,800, you could fly from LHR – SIN – SYD, on an A380 Suites Both Ways, In Singapore Airlines of course. 22 hours going, 24 hours coming back. I’ll stick with the opportunity cost — this is a non-controversial subject in economics. I have no need to re-invent the wheel. It works, it explains and predicts consumer behavior so that’s good enough for me. You guys can do whatever you please. Vaga, it’s economists and their wack thinking that got us into the recent financial crisis. You can keep your econ, it’s bogus. Nope, it was greedy, self interested, traders in an environment that did not punish individuals for taking undue risks that got us in the mess. If you are only looking to make your miles worth more, then you’re not going after where you really want to go. If I want to go somewhere really bad, even if the miles don’t worth that much when redeemed, as long as I am happy, what does it matter? Another example, I was able to redeem a coach ticket for 50,000 AA miles a flight JFK-NRT-Sapporo, under the old rules, I was able to stop over in Tokyo and go on to Sapporo. That ticket was valued at $2,200, so my redemption was a bit over 4 cents mile. Another example, redeeming AA miles to go to Moscow for 40,000, when the ticket was at $1,100. So that was almost 3 cents a mile. It sounds like long haul international flights, even in coach, you can get over 2.5cents value for your mile. FinAir flies to Moscow and St. Petersburg. You can fly JFK-Helsinki-Moscow (stop), St.Petersburg-Helsinki-JFK, this way you can have open jaw on AAdvantage award and if you fly before May 15, you can do it all for 40,000 AA miles. Probably of the best deals I got for seats to Russia, with open Jaw on a reliable European airline. Their fleet on this route is brand new, just a year old with all new Airbus-340s.